Davey Martinez talked before tonight’s series opener with the Pittsburgh Pirates about how he tried to stay positive in spite of the struggles that the Washington Nationals’ relief corps has dealt with over the first eleven games of the 2019 campaign. Heading into play on Friday night, after a strong finish on the recently-completed road trip, the Nationals’ relievers as a group had a National League-worst 7.79 ERA, a 5.08 FIP, which was the seventh-highest in the NL, a .299 batting average against, tied for second-highest, and a 1.73 WHIP, which was the fourth-highest among NL teams. So ... how does he stay positive? Patrick Corbin gave the Nationals seven strong in the series opener with the Pirates, but the 2-1 lead he handed to the bullpen turned into a 3-2 deficit in the top of the eighth with Tony Sipp giving up leadoff and one-out singles before Kyle Barraclough came on and gave up a two-run single on a knee-high 1-0 fastball down the middle of the plate to Starling Marte. Anthony Rendon homered for the second time in the game and sixth time this season in the bottom of the eighth, tying it up at 3-3, but it went to extras innings and Matt Grace gave up a leadoff double on a 1-0 sinker to Melky Cabrera, and Adam Frazier reached on an error by Grace on a sac bunt before the left-hander was lifted. Justin Miller took over and recorded one out before giving up a three-run homer by pinch hitter Colin Moran on an 0-2 fastball up and out over the middle, 6-3 Pirates. Martinez expressed some concerns about Miller’s velocity in his post game presser, and the reliever told reporters that he was diagnosed with a lower back strain which is going to land him on the 10-Day Injured List. As for the continuing bullpen issues overall? Martinez’s squad got a good start from Corbin and three runs of support, but the relief corps faltered again. The 1-0 fastball from Barraclough to Marte? “He had the right intentions, he tried to go down and away to Marte, and he just left the ball over the plate,” Martinez said. The 0-2 fastball to Moran from Miller that went out to right? “Just a bad pitch,” Martinez said. And the mood in the clubhouse after another loss in the bullpen? How is everyone dealing with the relief corps hurting the team again? Confidence in overall direction of Washington Nationals down to 45% in SB Nation FanPulse voting... How do you define the "bean" in baseball terms? How confident are you in the direction of the Nationals? What about Davey Martinez? 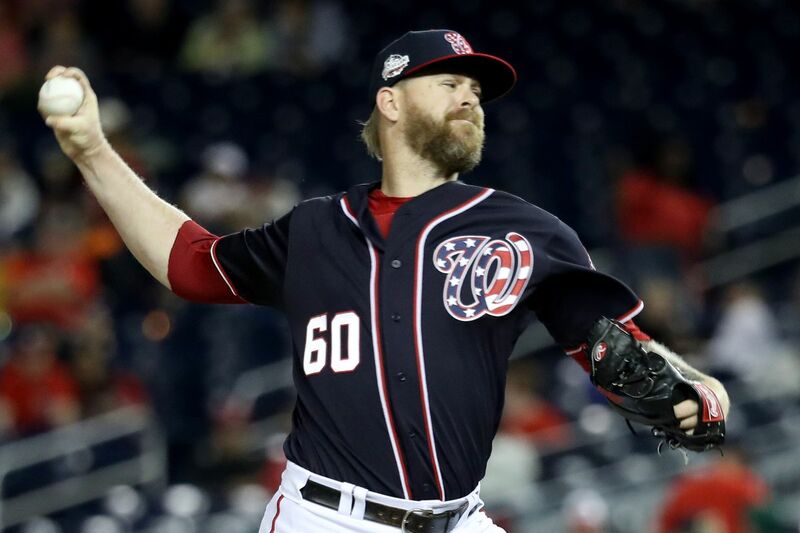 Nationals reportedly calling Carter Kieboom up from Triple-A Fresno Washington Post writer Jesse Dougherty was first with the reports tonight that Carter Kieboom is on his way to D.C. to join the Nationals in time for this weekend’s series with the Padres.